Mainly white master baths are peaceful, spa like retreats and modern classics. The term “antiseptic” is a favorite snub applied to an all-white bathroom. “Boring” is another term that finds disfavor. Not to me. I find much to admire in milky paint and tile tones unsullied by a need for color — particularly that airy, clean atmosphere that only white provides. Modern + white = cold? Not in this case. A sleek couples bathroom has a pair of custom cast concrete sinks with a Robern lighted medicine cabinet above. Streamlined architectural elements including a huge no-barrier shower. Nearly colorless glass pebble tile, used on the floor, continues into the shower adding texture that luxes it up and suggests all things natural without interrupting the calm. A partial glass partition acts as a shield for the shower without affecting the floor line. 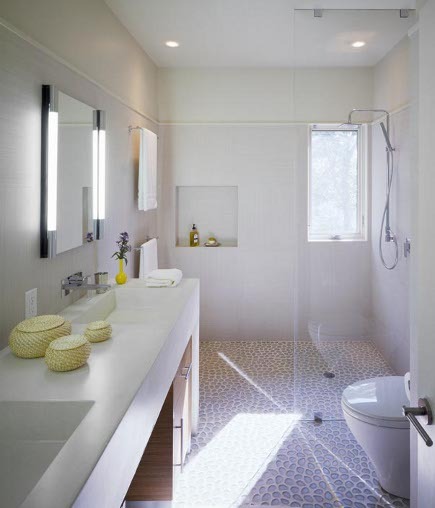 A touch of mid-century modern is blended into a bathroom by New York designer David Kleinberg. That’s accomplished via the strappy metal base of the console sink which hints at a Paul Prouvé table. A dark wood floor and freestanding tub pull towards a more traditional direction but this milkshake seems anything but vanilla.